How I Met Your Mother: "Bedtime Stories"
Quick Review: If this episode is viewing that you will be choosing, then you'll find it funny, clever, witty, and amusing. You may think you don't care now, but later you might weep. 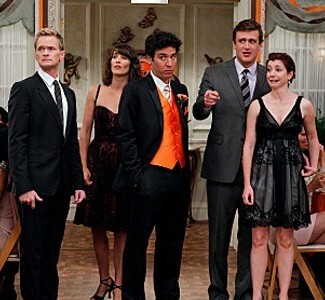 How I Met Your Mother: "Mom and Dad"
Quick Review: Some funny moments marred by an annoying A-plot. Spoilers ahead. Look, you might not appreciate this warning. I understand. But do you know that there are people out there without spoiler warnings? They have to endure a life in which anything can be spoiled at any time. They have to either live in total sensory deprivation, or learn to cope with the fact that everything they ever love will be spoiled. So please, appreciate what you have. Show me a group that can't laugh at itself, and I'll show you a group I want no part of. The ability to laugh at yourself, to be self-effacing, is a sure sign of humility. The ability to recognize the flaws, silly habits, and oddball behavior in yourself or your group keeps you grounded, and it can prevent you from making a huge mistake. It prevents groupthink. Groupthink is dangerous. It is deadly. It kills. It is what happens when a group achieves too much harmony and there is no conflict. The individuals in the group lose their identity and become a collective consciousness. No one dares disagree with the group, nor can they even see why they'd need to. Bad ideas seem like good ideas because everyone agrees. Years ago I was a student at Texas A&M University, a fine institution I am proud I attended. However, the year before I enrolled, they suffered one of the most horrific tragedies they've ever faced: The Bonfire collapse. Twelve people were killed, many more were injured. Since 1999, there has never been an official Bonfire at Texas A&M, though the tradition still continues off-campus. While the Special Commission Report pointed to the structural failures, the biggest cause, according to the report, was groupthink. No one saw a problem with students building a giant structure, the size of a four story building, without any faculty oversight. No one thought to make the students submit all their plans to the engineering or architecture department. No one thought to take every precaution to ensure that such a disaster didn't happen. 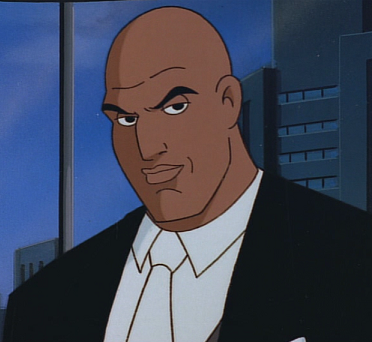 In any story, there is one character who is unwavering, uncompromising, undeterred. This character has no doubts about his course and knows, with utmost conviction, that he is right. This character never needs to naval-gaze, has no use for introspection, and will never second-guess. This person is the villain. The hero has doubts. The hero questions. The hero wonders if she's making the right choice. The hero wrestles with his conscience. Often, the hero must change and consider other viewpoints and perspectives. The hero must concede the possibility that she is wrong, that she might even be fighting on the wrong side. In many hero stories, it's not just a clash of good and evil, but also of doubt and certainty. That's why the best heroes, the ones whose stories I find the most interesting, are the ones who wrestle with doubt. They believe that they are doing the right thing, but their biggest fear, something many villains gleefully exploit, is the possibility that they might be on the wrong side. The villains never have this struggle. How I Met Your Mother: "Platonish"
Spoilers ahead, and if you don't want to feel so terrible about yourself that you spend the rest of your days wearing a garbage bag, you'll steer clear until after you've watched the episode. Now, you might be a bit brave, thinking that you can't be harmed by a few spoilers. Sorry to break it to you, but even the smallest spoiler can ruin your life. It doesn't even have to be a big spoiler. Just a little one. One so small that it goes unnoticed, crafty enough to sneak into the spoiler warning itself. Now, this might be a harmless spoiler, easily brushed aside. But it could be the one spoiler that manages to burrow straight into your brain and do things that even the internet finds disgusting, and you've met the internet. it takes a lot to creep that freak out. I'm not eating you. I don't care how awesome a meal you were the first time around. I don't care how zesty and flavorful you were. That was two weeks ago, and unlike Ghostbusters, you have not aged well. Like Ghostbusters, you are covered in unexplained green slime and some people from the EPA want to shut you down. So no, I'm not eating you. Don't take it so personally. It's not like I didn't want to eat you. I love leftovers. Sometimes food is better the second time around, and leftovers are an under-rated pleasure. That's why I get a to-go box when I'm dining out, as there's nothing like having last night's dinner for breakfast. Believe me, I am very pro-leftover. How I Met Your Mother: "The Lighthouse"
Quick Review: While it had a few good moments, it was a big, wasted opportunity. Spoilers ahead, so watch yourself. You'd hate to get spoiled, especially if you plan to take a trip to a very romantic lighthouse soon after. You'd climb all those steps, get to the highest point, take a look at the incredible view, and still not be able to get over the fact that you spoiled an episode because you read the review before watching. Your whole trip will be ruined, and I can't have that on my conscience. I mean, if I am responsible for ruining your trip, I'd want it to be for something a lot better than an episode review. I do have a reputation to maintain. The essence of drama is conflict. The essence of comedy is conflict. The essence of character is conflict. When there is no conflict, there's nothing really interesting going on. Lack of conflict is the essence of bad writing. 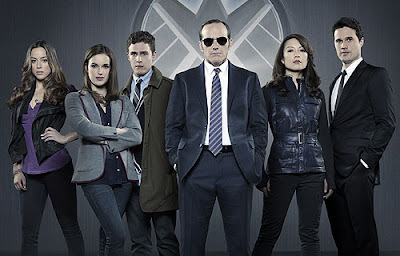 Sadly, this is one of the problems facing the new show, Marvel's Agents of S.H.I.E.L.D. There just isn't any good conflict. We get to know characters by their conflicts, and that's especially important in an ensemble show. When the characters lack dramatic tension, they lack defining characteristics and it's hard to tell them apart or even remember their names. Each character needs to both have a purpose and a conflict, because that's what we remember about them. The worst thing you want is for your characters to be forgettable.